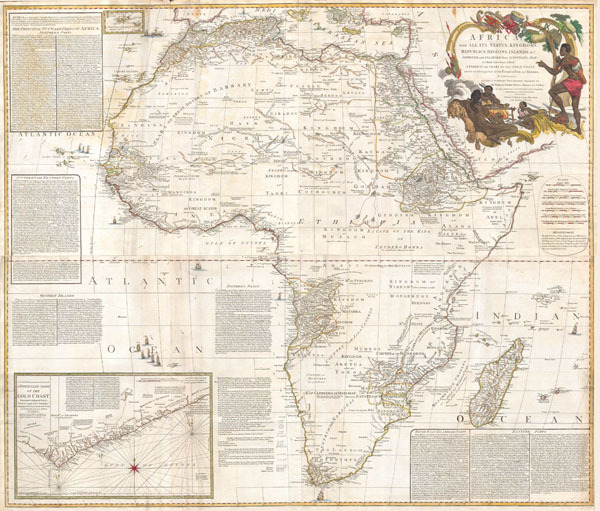 The most important map of Africa printed in the 18th century. Africa, with all its States, Kingdoms, republics, Regions, Islands, & cca. Improved and Inlarged form D’Anville’s Map to which has been added A particular Chart of the Gold Coast wherein are Distinguished all the European Forts, and Factories by S. Boulton. This is most likely the most important map of Africa produced in the 18th century. Printed at the height of the slave trade in 1787 by the Robert Sayer firm of London, England. Largely based upon the earlier D'Anville map, this map has been enlarged and expanded by Samuel Boulton. Depicts the continent in full with insets of the Gold Coast (or Ivory Coast, or Guinea). This map is unique in that it is a serious attempt to compile all of the accurate scientific knowledge of the African continent available at the time. In contrast to may other cartographers of the period there almost no attempt to fill the 'unknown' regions of the interior with fictitious beasts, kingdoms, and geological features. Boulton himself advertises 'The inland parts of Africa being but very little known and the names of the regions and countries which fill that vast tract of land being for the greatest part placed by conjecture it may be judged how absurd are the divisions traced in some maps and why they are not followed in this.' Despite this, this map actually does provide a wealth of information both in the form of a gazetteer printed in framed text boxes here and there on the map, as well as political and geographical features. An altogether extraordinary map and a must have for any serious Africa collection. Dated 6, January 1787. Robert Sayer (1725 - January 29, 1794) was an important English map publisher and engraver active from the mid to late 18th century. Sayer was born in Sunderland, England, in 1725. He may have clerked as a young man with the Bank of England, but this is unclear. His brother, James Sayer, married Mary Overton, daughter-in-law of John Overton and widow of Philip Overton. Sayer initially worked under Mary Overton, but by December of 1748 was managing the Overton enterprise and gradually took it over, transitioning the plates to his own name. When Thomas Jefferys went bankrupt in 1766, Sayer offered financial assistance to help him stay in business and, in this way, acquired rights to many of the important Jefferys map plates as well as his unpublished research. From about 1774, he began publishing with his apprentice, John Bennett (fl. 1770-1784), as Sayer and Bennett, but the partnership was not formalized until 1777. Bennett retired in 1784 following a mental collapse and the imprint reverted to Robert Sayer. From 1790, Sayer added Robert Laurie and James Whittle to his enterprise, renaming the firm Robert Sayer and Company. Ultimately, Laurie and Whittle partnered to take over his firm. Sayer retired to Bath, where, after a long illness, he died. During most of his career, Sayer was based at 53 Fleet Street, London. His work is particularly significant for its publication of many British maps relating to the American Revolutionary War. Unlike many map makers of his generation, Sayer was a good businessman and left a personal fortune and great estate to his son, James Sayer, who never worked in the publishing business. Very good condition. Four sheets professionally flattened, joined and backed with linen. Original color. Tooley, Maps of Africa (Map collectors circle no.47), p. 4; P4300.